The world is doomed and you can help! 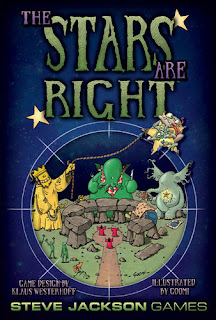 In The Stars Are Right, you take the role of a cultist, summoning the creatures of horror from beyond time and space as created by the fiction writer H.P. Lovecraft. The object of the game is to be the first to accumulate 10 victory points worth of summoned creatures. The sky is made up of a 5 x 5 grid of 25 double-sided tiles depicting various types of stars. Players will start with a hand of creature cards from which they will choose their actions. The cards range in point value with Minions at 0, Lessor Servitors at 1, Greater Servitors are 2, and Great Old Ones at 4. The actions that may be performed by playing creature cards are to rearrange the tiles in the sky, to summon creatures, and to modify card symbols. 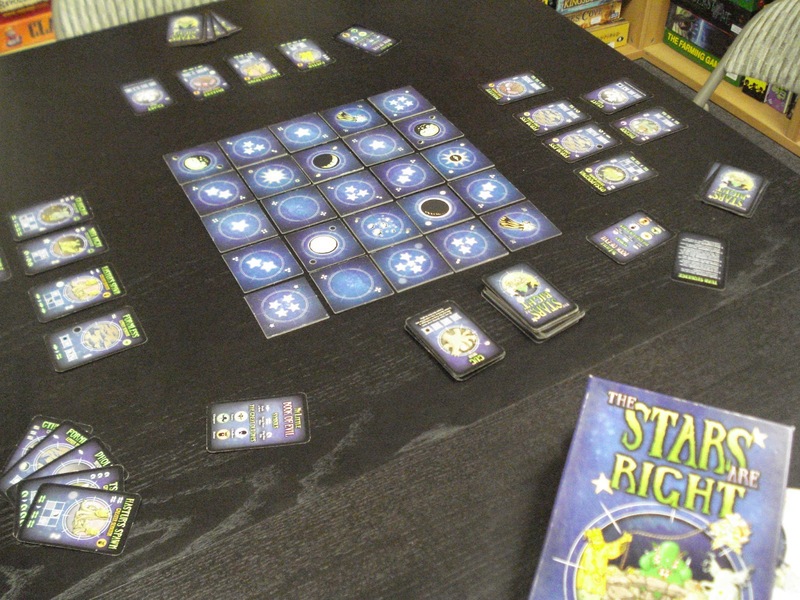 Invoking a creature lets you rearrange the star tiles in the sky through a series of flips, pushes, and swaps with the objective to line up the right stars in the right pattern that will allow you to summon a creature from your hand. Summoned creatures can bring both victory points and additional powers to change the sky. The key is to build your horde of Servitors so you can make a chain of flips, pushes and swaps, rearranging the entire sky. Make the stars right, summon Great Old Ones, and win. The Stars Are Right really challenges your spatial abilities. We have an open copy of The Stars Are Right available in our Demo Games Library for you come in and try.